Mexico’s decision to disband its tourism marketing agency will benefit other holiday destinations in the region, according to industry experts. Bill Geist, CEO of Wisconsin-based tourism consultancy firm DMOproz, told the travel news website Skift that the government’s decision to eliminate the Tourism Promotion Council (CPTM) was “a headscratcher,” and predicted that Caribbean and Central American destinations will benefit, with one in particular poised to cash in. Amir Eylon, president of the tourism consulting firm Longwoods International, offered a similar assessment. “Any destination that is a direct competitor to Mexico right now should be saying thank you to the Mexican government . . . 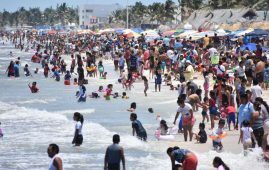 The Mexican beach destinations obviously compete with other beach destinations in Central America and the Caribbean and even the U.S. Do I go to a Florida beach or do I go to Cancún?” he said. Alejandro Zozaya, CEO of hospitality-travel firm Apple Leisure Group, said that bookings for Cancún and the Riviera Maya are down 14% to 16% compared to a year ago, adding that every destination in Mexico is experiencing a decline in tourist numbers or in the quality of visitors. Conversely, visitor numbers to Costa Rica, Jamaica and the Dominican Republic are all up compared to last year, he added. “Clearly, Mexico is losing market share,” Zozaya said, explaining that the disbandment of the CPTM is one part of a “perfect storm” that is battering Mexico’s tourism industry. Other factors that are impacting negatively on tourism are crime and violence in some parts of the country and the arrival en masse of sargassum to the Caribbean coast last year, he said. The U.S. Department of State has responded to increasing violence in Mexicoby issuing a new security alert in the lead-up to Spring Break while last year it warned against traveling to some states altogether. With such advisories generating negative publicity about Mexico in the United States – the nation’s No. 1 source country for visitors – Geist contended that it is more important than ever to have a marketing agency that can paint the destination in a more favorable light. “With the travel advisories that are out, they need to get control of that message. And there’s nobody to control that message,” he said.